We all need to stay hydrated and this Doctor Who water bottle is gone be helping with that. This double walled water bottle is plain see though on the outside but the inner bottle shows on one side the Tardis and the text “Wibbly Wobbly Timey Wimey” on it and on the other side the Doctor Who logo with some writing from Gallifrey. This bottle is made from BPA free Tritan and that makes it strong and nice looking and the no spill top makes it just perfect for everyday use. Now can drink you water from a special Tardis water bottle that maybe bigger on the inside. This Doctor Who water bottle is made from Tritan a strong BPA free plastic and is see through and has a double walled design. The inner wall is blue with the Tardis on it and on the outerwear you can find the Doctor Who logo and some other characters. The 18oz. water bottle has a sports top with straw and will not leak and it also has a loop on it so that you could hang it on your backpack or something like that if you want. We all need to hydrated and for that a water bottle is ideal but often they are a bit to big to carry around with you all the time. But now there is this Tardis flask that offers you the opportunity to carry around 8oz of liquids in a small metal bottle. This flask is perfect for time and space travel so I would expect that Doctor Who carries one just in case he get thirsty. 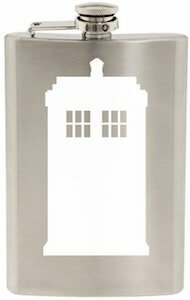 On this metal flask you can see a white image of the Tardis. The image of the Tardis is hand etched into the bottle for optimum quality. Get ready for a sip out of your new Doctor Who Tardis Flask. Now you will never be thirsty again! This Doctor Who Tardis flask will hold the preferred liquid and looks stunning to. This handmade Tardis flask shows a picture of the Tardis on the front but this Tardis is not the normal blue, this Tardis has the whole galaxy printed on it. Now you can dee where the Doctor traveled to as it is printed on the Tardis. This flask can hold up to 6oz. of drinks and is great for in your pocket or a bag. Every Doctor Who fan wants one so that they are not only cool because they have a flask but because they have a Tardis flask. So lets not wait any longer, come get your Doctor Who Tardis Galaxy Flask. Are you looking for Doctor Who flask that you can easily take and can carry a drink when you need one. 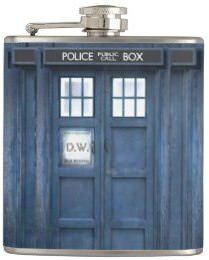 This Tardis flask shows the doors of the Tardis on the front and the sign on the door can hold you initials (free of charge) this one says D.W. for Doctor Who but yours can say something you like. 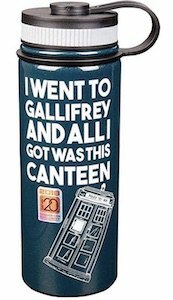 The Tardis flask is great for many liquids but I prefer it with boring water in it. You can store up to 6 ounce of liquid in this flask. 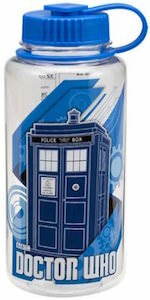 And the Doctor Who Tardis flask is handmade in the USA and has a high quality vinyl wrap that hold the Tardis. Put a flask in your bag or pocket and let it be a fun Doctor Who Tardis Flask.